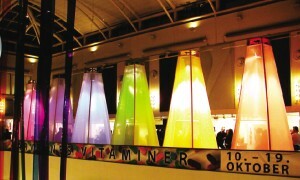 In October 2002, an experimental exhibition ‘The Vitamins of Colour’ took place in ‘Det Ny Illum’ a well-known department store in the centre of Copenhagen. The exhibition was organised by Template Stiftelsen in Denmark and took place over ten full days, attracting more than 10,000 visitors. The idea for the ‘The Vitamins of Colour’ exhibition came from the understanding that colours and light are nurturing vitamins which affect the functioning of the human body and the way we think. Most importantly colour influences our state of mind. The exhibition focused on the ability colour has to influence personal energy levels, balances and thought processe, through using specific proven technologies. It also stimulated new ways in how to think, for example in selecting colours worn or used to decorate different rooms at home or in the office. In this article Mark Stolk invites us to have a look into the wonderful and magical world of colour, inspired by The Vitamins of Colour exhibition 2002 in Copenhagen. We have all seen the beautiful panorama of a rainbow when the sun’s rays break through the clouds on a rainy day. We might also have performed an experiment using a prism, holding it up to the sun and watching as the sunlight breaks into the same spectrum of colours. Isaac Newton first demonstrated this in scientific experiments in the 1600’s, and he also showed that re-combining these colours of the spectrum created white light again. Although he recognised that the spectrum was continuous, Newton used the seven colour names red, orange, yellow, green, blue, indigo and violet for segments of the spectrum in parallel with the seven notes of the musical scale. The spectrum is only a small part of the whole band of electro-magnetic radiation. One could say that the colours of the spectrum are the first visible expression of unseen energy for us. Newton recognised this when he said, “rays themselves are not coloured. Within them is nothing but a certain power...to stir up the sensation of this or that colour”. It could therefore be said that colour is a “cloak” of force - a visible and more materialised embodiment of “power”. Scientists use such names as wavelengths and frequencies when they talk about the force inside colour. The human eye can see and discern approximately seven million colours! When we look at a certain colour, we can attract to ourselves the energy that is on the same frequency as the particular colour. Colour and light are impressions upon which we feed. The question is, what do the forces or energies associated with that colour cause in us, what do they activate or sedate, stimulate or anaesthetise? Does colour have an influence on us and, if so, on which part and in what way? And how can colour influence our thoughts, feelings or actions? Various documented researches have shown that certain colours stimulate certain organs and bodily functions as well as influencing states of mind. A red coloured room causes our body temperature to rise, whilst a blue room does the opposite. The colour red increases strength in the muscular structure, whilst pink does the opposite. Over the last few decades many scientists have reported the successful use of coloured light in the treatment of a wide variety of psychological problems and diseases. Blue light, as an example, has been used in the treatment of psychological problems, including addictions, eating disorders and depression. Because the colours we see are combinations and derivations of the seven spectrum colours, it seems logical to try to understand the nature, function and influence of these seven colours first. For this reason we designed seven, five metre high, ‘spectrum’ tents for the exhibition, each one lit up from within by a coloured beam in one of the seven spectrum colours. In daily life we are mostly exposed to the influence of a multiple spread of light and colour that make any observational effects of a single colour difficult to detect or identify. The exhibition tents were built to separate out these colours to give a person the opportunity to see and register the difference with each colour and its particular qualities. The indigo tent, as an example, caused more than eighty per cent of people to feel inward and slower. The red tent caused many people to feel calm and settled. This may seem to contradict the nature of red, which tends to cause people to feel more physically active and strong. However, colour is a vitamin and so can improve certain deficiencies we may have in our system, and so restoring balance and causing settlement. This is especially true of red, the energy of which can become depleted due to the pace and stress of our world. The tents were a live experiment both at a personal level to discover a particular proneness at any given time, but also to further the research into how colour affects our lives. In one part of the exhibition there was the opportunity for people to have an arm test, using an arm testing method practiced in The Template Foundation and inspired by the science of kinesiology to detect energy and colour balances. This method involves people holding a card with one of the spectrum colours in their hand, whilst an arm tester measures their strength and resistance to each colour. The degree of resistance gives the tester an indication of what kind of colour the participant needs in order to come to his or her natural state of energy balance, and the person was accordingly invited to sit in one of the coloured spectrum tents. This method, whilst simple, proved to be very effective and helped people understand themselves better through their specific colour proneness. It is acknowledged by many that colour is not only experienced by us through our sight, and that we can register and feel colour with other senses. Experiments performed in the 1960’s in Russia proved that one out of six people can feel colour with their fingertips after some simple training. They believed that this percentage would be much higher with more training and especially if people could be brought more back in touch with their natural self. The sensations people register in trying to feel colours vary - there may be tingles in the hands or slight temperature changes. Many people also record specific feelings, mental imagery or particular states of mind when they expose themselves to certain colours. It suggests that we can translate the forces locked up in colour through other senses than just that of sight, and it is perhaps no wonder that some musicians experience certain pieces of music in colours. All this made us wonder whether we can also taste the influence of colour? In order to experiment with this we set up seven transparent tanks filled with spring water, each one exposed to light in one of the spectrum colours. Many people were astonished to find that they could taste a difference in water lit up by different spectrum colours! Many experienced ‘red’ water as harsh, with a slight iron taste, ‘yellow’ water as more sweet, and ‘blue’ and ‘green’ water as softer and gentler to the taste. Although many people could taste a difference in the ‘orange, indigo and violet’ water, most of them had difficulty describing the taste. If certain human thoughts, feelings or actions cause certain colour radiations or combinations of colour, can it then be that certain specific colours or colour combinations cause specific thoughts, feelings and actions? One part of the exhibition was called the ‘D.A.M.P.’ room. This room was painted in specific combinations of colours to strengthen the learning process in children with hyperactivity or a deficiency in attention span, motor control and perception. The specific colour combinations cause a calming, sharpen the attention and give clarity in thinking, as well as causing a more open receptive state of mind. This specific colour combination, designed by Marianne T. Nielsen from the “Template Stiftelsen” in co-operation with The Plasma Group from Israel, is now used in some classrooms for a special school for D.A.M.P. children in Copenhagen. The Vitamins of Colour exhibition passed on in an experiential way some of the groundbreaking discoveries and researches made by Template Stiftelsen and different international Teams around the world. Perhaps it also conveyed a feeling many have - that we are entering a time when colour will be more acceptable as a tool to better health and well-being, and when it will also be applied as an indicator of how we can live a more progressive and natural lifestyle. And it might be that as we come to deeper understandings about colour, we discover more about ourselves and what shapes and influences us!